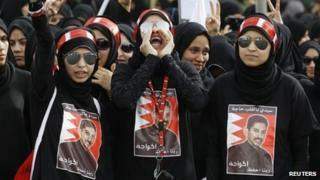 Human rights and political activist Abdulhadi al-Khawaja is an outspoken critic of Bahrain's ruling Sunni royal family and was sentenced to life in prison by a military court in June 2011, accused of trying to depose them. Mr Khawaja staged a 110-day hunger strike in protest at the verdict, which he called off in May 2012. His decision came after Bahrain's highest court referred his conviction and those of 20 other activists and opposition figures to the criminal court of appeal. However, on 4 September a civilian court upheld the sentences. Human rights groups had said Mr Khawaja's military trial was "grossly unfair". Speaking in April after the appeal before the civilian court was granted, Mr Khawaja's wife Khadija al-Moussawi accused the authorities of "playing for time". Bahrain has suffered unrest since pro-democracy demonstrators occupied a prominent landmark in the capital Manama - Pearl Roundabout - in February 2011. At least 60 people, including five police officers, were killed, hundreds injured and thousands jailed. The protesters were forcibly driven out of Pearl Roundabout by security forces in March 2011, after King Hamad declared a state of emergency and brought in troops to crush dissent. Abdulhadi al-Khawaja told the BBC before his arrest on 8 April 2011 that he had deliberately stayed away from Pearl Roundabout. "I don't want to give the authorities any reason to arrest me," he said. He was nevertheless picked up in a late-night raid on his daughter's house. According to his family, he was beaten by police and not allowed to take his medication with him. He was also not permitted family visits for weeks. According to testimony he gave to the Bahrain Independent Commission of Inquiry - a panel of human rights experts asked by King Hamad bin Issa Al Khalifa to look into the unrest, and headed by Professor Cherif Bassiouni - Mr Khawaja suffered prolonged torture while in detention. Mr Khawaja said his jaw had been broken in four places when police and masked men burst into his daughter's home and seized him. He was taken to a Bahrain Defence Force (BDF) hospital and spent seven days blindfolded and handcuffed to his bed, he told the BICI. While in hospital, he and his family were threatened with sexual abuse, he said. Mr Khawaja said he was then sent back to prison, where he spent two months in solitary confinement and was denied access to a lawyer. He also alleged that he was sexually assaulted and regularly beaten by guards. In May 2011, Mr Khawaja and the 20 other activists and opposition figures went on trial at the National Safety Court, a military tribunal. Seven defendants including Mr Khawaja were sentenced to life in prison. Others were sentenced to between five and 15 years. Mr Khawaja's conviction was based on a confession he made under duress, and no evidence was presented showing he had used or advocated violence during the mass protests against King Hamad, according to Amnesty International. On 29 January 2012, Mr Khawaja and 13 others who were in the dock alongside him began a week long hunger strike in prison in protest against their convictions, and the continued suppression of dissent. Shortly after, on 8 February, Mr Khawaja began a new hunger strike. At the end of March, he told his family and his lawyer that he was starting to reduce his glucose intake, which he had been taking along with water to sustain his health. Mr Khawaja's health deteriorated significantly with his weight dropping to 51kg (112lbs), 16kg less than before his imprisonment, and he was treated in hospital in Bahrain. Denmark requested that Mr Khawaja be released and sent there for treatment, on the grounds that he has Danish citizenship. But the Supreme Judicial Council rejected the request, saying that the law prevented the transfer of "accused and convicted persons to foreign countries". The decision was criticised by the UN and EU. The 52-year-old told his family on 17 April that he had removed the intravenous drip keeping him alive. Later with international attention focused on Bahrain ahead of the Grand Prix, he said he had stopped drinking water and wanted to write his will. His daughter, Zainab, wrote on Twitter on 20 April: "He said: if they won't allow the lawyer to see him, he has three things he would like everyone to know. "Firstly, he is completely convinced in what he is doing. Secondly, he asks that nobody attempts to go on a similar strike until death. "Finally, my father said: 'If I die... I ask the people to continue on path of peaceful resistance. I don't want anybody to be hurt in my name'." But his wife saw him ahead of the ruling by the criminal court of appeal and said he had been restrained and force-fed through a tube. The hospital denied force-feeding him saying Mr Khawaja gave written permission to be fed via a nasogastric tube.